Bright lights, Big City. Enjoy The Big Apple aglow in all its splendor. Start your tour on Times Square, and ride down famous 5th Avenue. See the shops on 5th Avenue, NY Public Library, and more! Make stops at Washington Square Park, City Hall, Madison Square Park, and Grand Central Terminal. Head through Greenwich Village and cross over Manhattan Bridge to Fulton Ferry Landing in Brooklyn to experience great views of the Brooklyn, Manhattan, and Williamsburg Bridges and the mesmerizing lights of Manhattan. Marvel at the famous view of Lower Manhattan with all its twinkling brilliance (Think Woody Allen’s Manhattan). The NY See The Lights! Tour works just like our famous NY See It All! tours – get off the bus at major stops, free refreshments on board, and the best tour guides and drivers in the city. This tour runs from April – November. It is closed in January & February, and is the Holiday Lights Tour from November 30 – January 5. NOTE: From November 30 to January 5, the NY SEE THE LIGHTS! 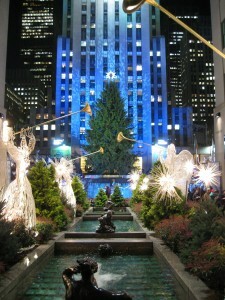 Tour changes to a holiday itinerary and becomes the NY SEE THE HOLIDAY LIGHTS! Tour. Click here for more information.